Tesla has followed a “clean aesthetic” for the car. Unfortunately this clean aesthetic for me went too far and there is no center console. I’ve been waiting for two years to get one and am more than a bit tired of my center junk floor. 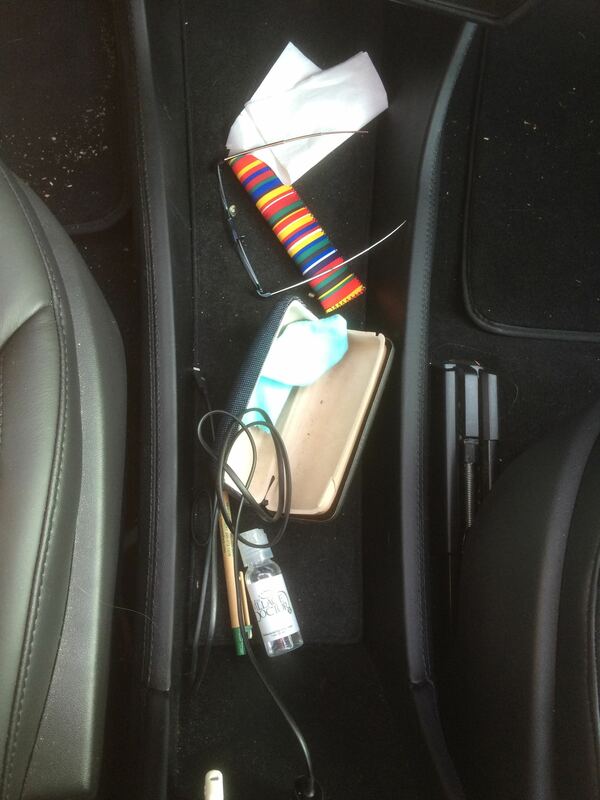 At some point last year, the Tesla center console was finally available in my interior finish, Piano Black. I decided to order one. Earlier this year I got a phone call saying my center console was in and I can have it installed. I decided to do that at the same time as my annual service appointment. When the driver arrived with the loaner, I had a discussion with him about the center console. He seemed very unimpressed with the center console and said a good 50% of the customers preferred not having it. He suggested I find a friend who had a center console. I know a few folks who drive Teslas, but no friends that I see on any regular basis nor any that have a center console. I also knew that other owners and reviewers had complained that the finish of the console was not the best but I knew that wasn’t my largest concern. It turns out that the driver and I have the same iphone case made by Speck. He said that I may not be able to charge the phone in the dock with the case on! This feature is key for me. 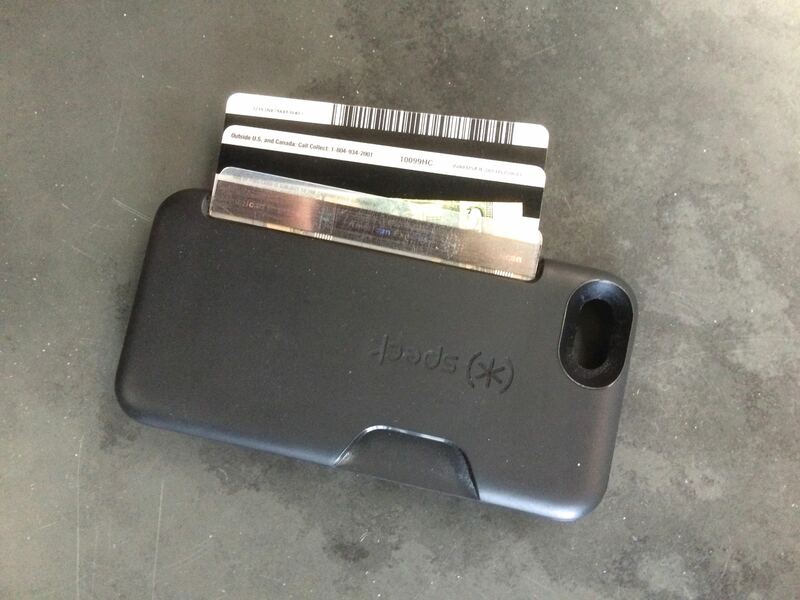 I love my Speck case because within the case you can put two credit cards, a $20 bill and an ID. I haven’t carried a wallet in about a year. Eventually I could envision an even smaller case once Apple Pay and other pay by phone mechanisms are more widely accepted. But if I can’t use the phone charging dock the center console is a dud. I am a huge water drinker, so the design of the cup holders is important but I have identified a set of stainless steel water bottles that I using in the existing cup holders. I am interested in larger cup holders for more flexibility with carrying larger water bottles. I have looked around the other third party consoles and none of them appear to offer exactly what I want, and I really want to see them in person! So for now I’m looking for a simple black box with a lid to keep on the floor. But after looking online for a while, even finding a reasonable looking black box with the right dimensions is not that simple. I bought a full new set of tires per the recommendation of my local mechanic, Ron Raimes automotive. 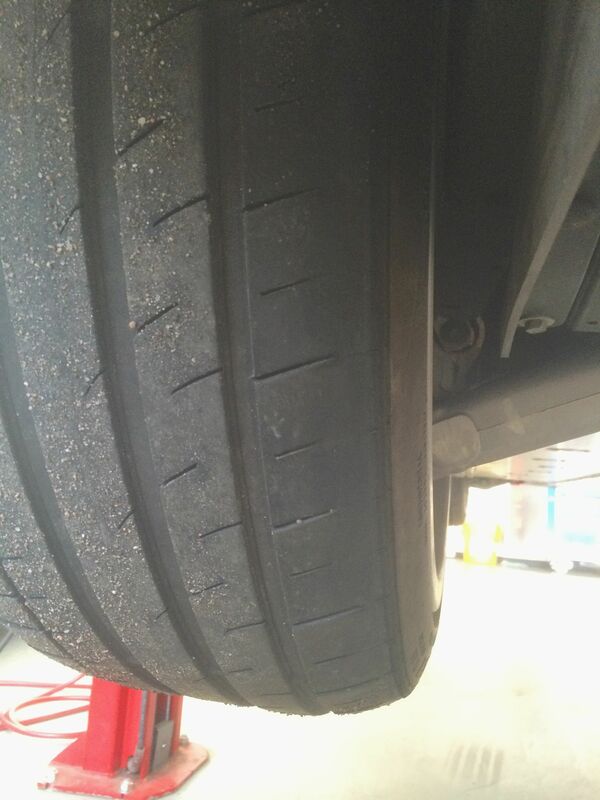 The tires were again wearing heavily on the inside sidewalls in an unusual pattern as you can see in the picture below. 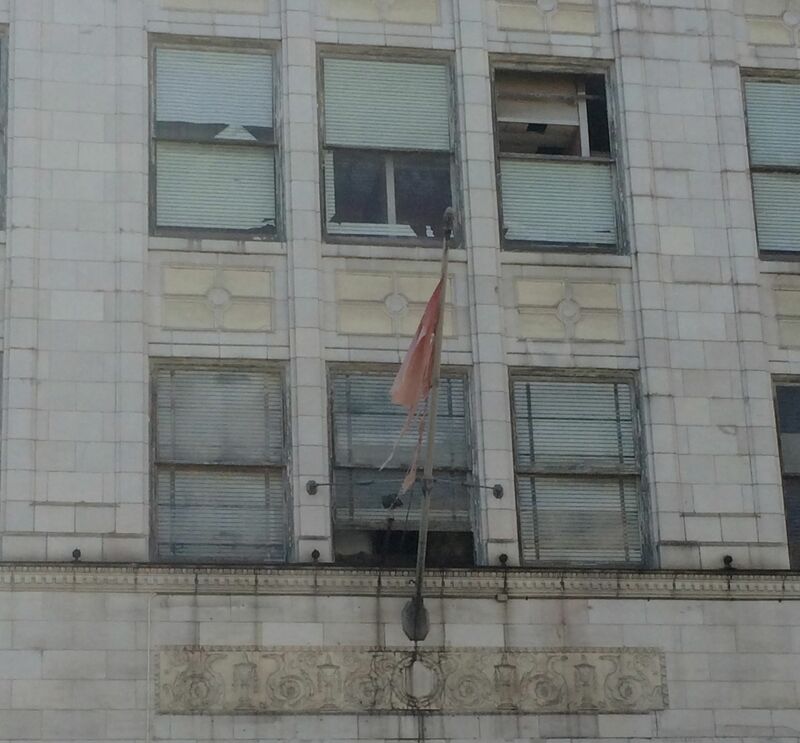 The standard inside wear markers were not yet worn down. These set of tires are not nearly as bad as the last set, but they still did not wear very evenly. When he looked at the alignment before installing the new tires, the alignment for both the toe and the camber were again out of spec. My mechanic suggested that he would install the tires, align them and then suggested I come back again in 1,000 miles to see if the tires would stay aligned. Since Tesla had been quite responsive when I had alignment issues in the past after emailing them at the VP level, I decided to send them a note discussing this current state of alignment. Only 7,000 miles had passed since the Minneapolis center had adjusted my alignment again, so I was a bit concerned. I took my car to the Sunnyvale service center and explained the entire saga. I had only driven my car 200 miles with these new tires. When they checked my alignment, the tires were again out of alignment. The alignment had shifted in those 200 miles but the vehicle measurements clearly show that the camber is out of alignment. 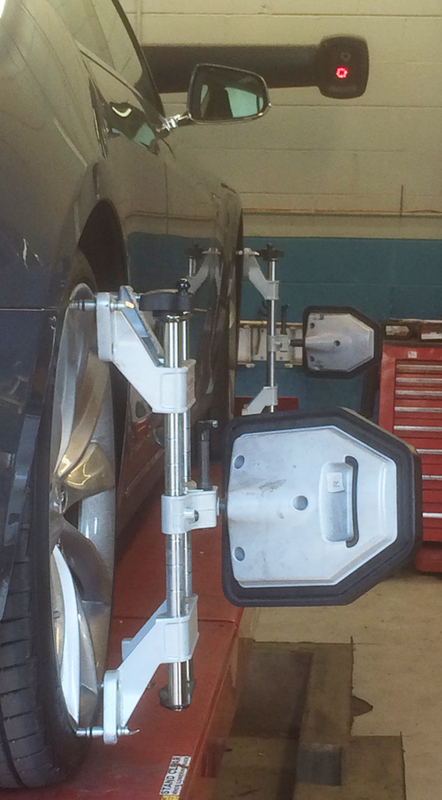 A tire shop has no ability to adjust the camber. The camber in the rear was at -2.3 and -2.32 with the spec being between -1.4 to -2.1. Because I had expected to wait at the service center, I did not bring my house key or garage door opener, and the car was driven 30 miles between the first 6/26 check by Tesla and the second set of numbers the next day when they did the alignment. I am a bit concerned about the amount of variability in the shift of the front toe. The front left shifted from -0.16 to -0.27 in 30 miles and the front right shifted from 0.07 to 0.31. 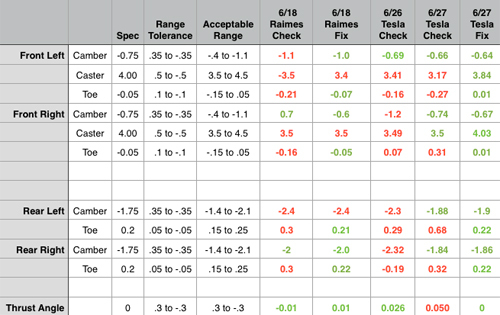 I have included five sets of alignment data in the table below over the course of 250 miles. I am a little concerned that the alignment does not appear particularly stable although these numbers are quite small. In both shops, I watched the alignment process. They use the same brand alignment machine, Hunter, which uses lasers to accurately check the alignment. As an odd side note, my summer job between junior and senior years of college was working with laser interferometers at Hewlett Packard, so I know these machines are very accurate. My local garage did complain that the rear tires are physically difficult to align. The configuration of the car makes it quite difficult to get the mechanic’s arms in the correct place to adjust the alignment. Sunnyvale Tesla in the end concluded the problem with my alignment was the camber bushings, which is the rubber part in the camber arm. 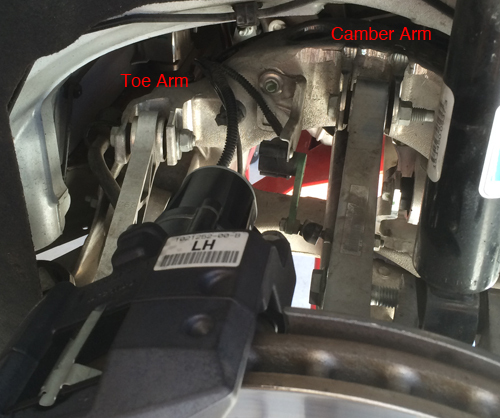 They replaced both camber link arms with a newer upgraded version. 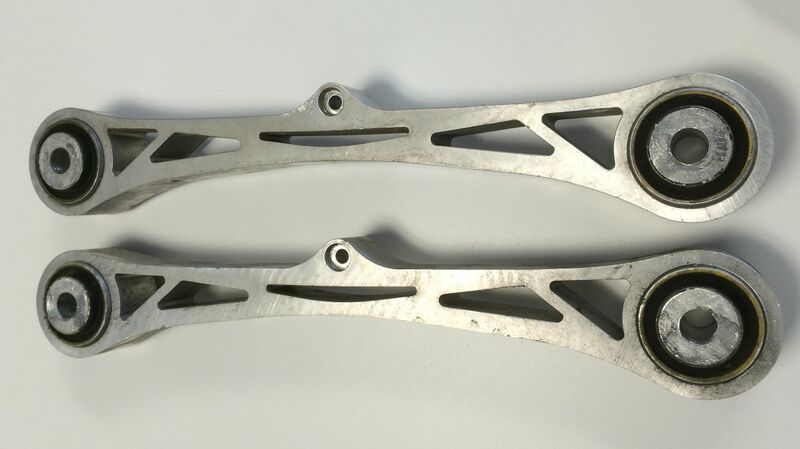 The new camber arms also have an improved design and a more complex shape that should support more torque than the original camber arms. I am hoping the challenges with alignment are completely solved, but I will have it check again by both my local mechanic and Tesla to ensure I can drive many miles with these new tires. 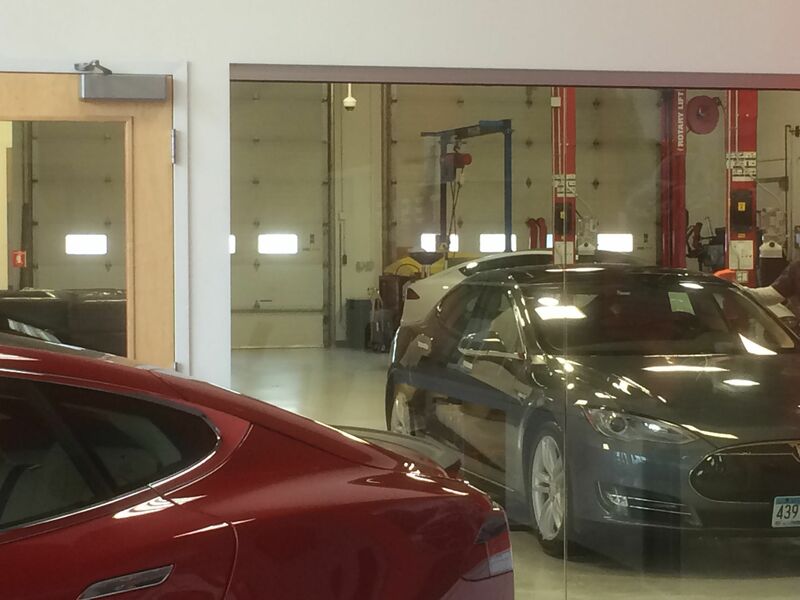 After another 6,000 miles of driving since the last tire rotation in Minneapolis, I decided to call the Tesla Denver Service Center to have my tires rotated. They could either fit me in at 7am or 11:30am the next day. Neither time was convenient, but I chose to get up at 5:30 to avoid traffic and get my tires rotated. The Minneapolis Service Center had indicated that I may get another 12K miles out of all four of my tires. Unfortunately, the new report was only a tight 1K on the original Continental tires and maybe 3K on the newer Michelin tires. In the best case my new Michelin tires would run 9K on the rear and 6K on the front. The Continental pair that had alignment issues lasted 12.5K on the back alone. Almost all of the wear on the Tesla Model S tires occurs when the tires are in the back. I was informed that because the 5.9 firmware now allows for the low suspension, my additional accelerated wear was probably due to using this low setting. As the vehicle lowers itself, the suspension angle changes and the camber becomes more negative which means more insdie edge wear. Since I spent a lot of time freeway and highway driving, I was not accelerating frequently. I was however regularly manual lowering the car. I was quite saddened by this news of low tire wear. A trade-off for an environmentalist: use slightly more energy or wear out tires faster? 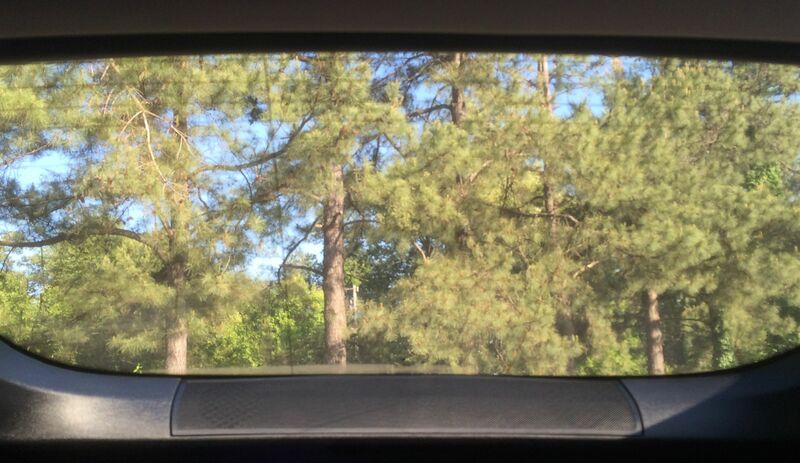 Okay, a perfect environmentalist would be driving with the 19″ tires or not driving at all. I do not plan to use the low suspension setting again outside of cases where I really need to maximize my range as it is simply not worth wearing out my tires. At this point, I am not sure I would buy the air suspension again. My primary purpose of buying the option was for increased range. None of the loaner cars I have had to date have had the standard suspension, so I cannot comment on the handling differences. I spent several days of my cross country and back journey off the grid — as in off the supercharger route. I had no real interest in doing the exact same route up the eastern seaboard. I wanted to visit a friend in Nashville and see a few other places along the way. My first stop would be Macon, Georgia. The forum had reported that the unofficially opened supercharger in Macon was working. Plugshare.com indicated a slower charger up the street in case this supercharger was not available. Various other drivers had reported successfully charging there so I was not particularly concerned. The charger is located behind the visitor center. I walked over to the Harriet Tubman museum while the car charged. Between Macon and Atlanta was a distance of only 101 miles. I visited the Martin Luther King Historical Site and another museum. For charging I decided to try to charge overnight at the Tesla Service Center in Marietta, Georgia. I had called ahead of time to ask about charging and was told the chargers were outside the building. I am glad I arrived during business hours as the outside chargers were all busy when I arrived. The folks at this service center were very friendly and offered to drop me off at my hotel. I chose the Hampton Inn that was about 1/4 mile away from the service center so that I could walk if necessary. They also picked me up in the morning to take me to my car. Many service centers have chargers only inside the facility. I will always plan to arrive during business hours. I had two choices to drive north from Atlanta. I initially planned to drive through Chattanooga, Tennessee. I had found a hotel on a site that listed it as having charging facilities. When I called this independent hotel, they informed me they did not have charging facilities. I also contacted a couple of private Tesla owners on Plugshare.com. In the end, I decided to go to Birmingham instead which is around 150 miles away. I was interested in the Civil Rights Museum and found a Chargepoint charger located nearby. I could easily charge while visiting the city and sleeping at a nearby hotel. The charge took about 8 hours and was free as was the parking at the McWane science center. I enjoyed my visit to the museum and the art museum. The charging facility was not in the best of neighborhoods, so I did not return to the car in the evening but I saved hotel parking charges. The next stop was my friend’s house near Nashville Tennessee about 105 miles away. 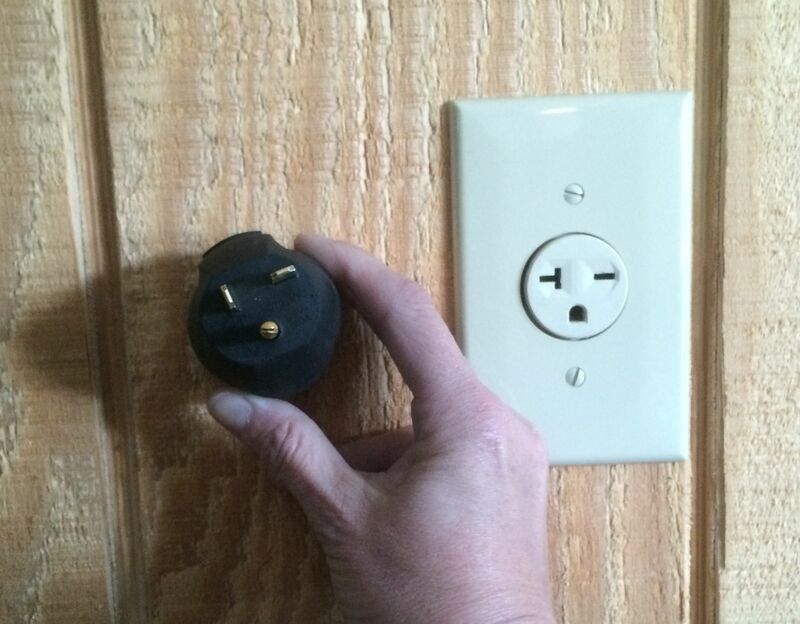 They have a plug very similar to one of the Tesla plugs available for sale. But upon careful examination the plugs did not match exactly! After an unsuccessful trip to Home Depot for a simple adaptor, we drove to a Blink charging station nearby. It was already 8pm and the charger said it would be complete in over 17 hours. We continued searching on various apps and driving around to a non-existent public utility plug to discover that all charging stations in the immediate area were the same Blink network. A nearby nudist colony had a charging facility. I decided to leave the Tesla at the Blink station. Luckily the charge did not take a full 17 hours and was more on the order of 15 so I managed to leave for my next destination by mid day the next day. My next off the grid stop was a campground in Paducah, Kentucky about 180 miles away from my friends house. Plugshare.com indicated that there was an EV friendly campground there. I had wanted to try charging overnight and sleeping in the back of the Tesla. While charging, you cannot run the climate control. The owners were quite friendly and only charge $10 for an EV whether or not you stay at the facility (price may change for an overnight stay). They have had four Teslas charge there. A motel is about 1/8 of a mile away along with a place where you can buy food. Some of their stations were compatible with my adaptors but several were not. I set up my Tesla for sleeping and found the car nice and quiet despite the freeway being within a reasonable distance. The RV park was much quieter than a regular campground since almost everyone was within their RV. The two difficulties I had with sleeping in the RV park was that it was so well lit it interfered with sleeping. The second challenge was the slope of the Tesla with the rear seats down. I bought for the trip a very thick sleeping pad but also needed two other supports in the seam between the seats to be comfortable. My backup plan was to go to the Tesla St. Louis service center but in the end this was fortunately not necessary. Going off the grid takes a lot of careful planning and interferes with wanderlust. Waiting for a charge during the day is quite tedious, so in essence I consider myself limited to a driving distance of around 200 miles a day. The websites that are available to plan are not ideal. None offer the ability to search for charging facilities just at hotels for example. Plugshare.com is the most useful website and their related recargo is the most useful app in general. The Allstays app is nice for the RV parks as you can filter by available amps. I also liked that the app allows you to dial the RV park directly to double check on both availability and EV friendliness. On the road while entering Minnesota, I decided to try to get my tires rotated in Minneapolis. I called Tesla and turns out they could accommodate me the next day! I was quite surprised given the late notice. And even better yet when I arrived they even had a loaner vehicle! This kind of easy service does not happen in California. The Minneapolis service center only supports around 250 vehicles though. I did request that they add the titanium shield. The shield was added as a tiny additional protection from fire damage after the media over responded to a few fires last year. From the sounds of the name “shield”, I was daydreaming that the shield might keep my battery warmer and improve my mileage. But it turns out the shield is really just a relatively small piece of metal put on to cover a slight vulnerability in the car in front of the battery. My regular blog readers are familiar with my unfortunate saga with my tires this year. Since I had put on almost 6,000 miles I knew it was time for my free tire rotation. I also warned the service advisor about what had occurred and asked for some information about how my tires were wearing. The new tires (moved from back to front) are at 6/32 inside tread 8/32 center tread and 7/32 out side tread. The now back tires (with 18,000 miles on them) are at 8/32 across the tire foot. Telsa estimates that the full set should last another 12,000 miles and I will be due for one more rotation in another 6,000 miles. During this trip I have had a message flash on the screen several times: “Service Tire Pressure System… Contact Tesla Service.” I had this problem before in California, so I had not been particularly concerned. The service department in California also replaced the system previously. Fortunately, the Minneapolis service department apparently found a stronger fix. The problem was with my left front tire, which had received probably the majority of the wind gusts on this journey. The connection between the tire and the antenna, which is located in the left side mirror, was weak. In the car is a “tube” that goes from front to back where they can add new wiring. So to solve this issue, they added a new antenna in this area and hopefully permanently fixed my false tire pressure warnings. In summary, I would give the Minneapolis service department a great review. They found a clever solution to the Tire Pressure Warning System that has plagued my car, and responded to my request for detailed information about my tire wear. They accommodated my last minute request and even cleaned the “Utah dust” off my car.